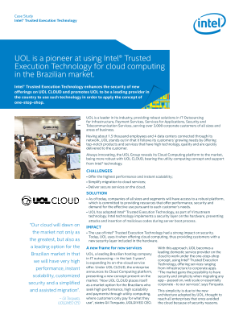 UOL is a pioneer at using Intel® Trusted Execution Technology for cloud computing in the Brazilian market. Intel® Trusted Execution Technology ensures the security of new offers on UOL CLOUD* and promotes UOL to be the first provider in the country to use such technology in order to apply the concept of ...one-stop-shop. UOL is a leader in its industry, providing complete solutions in IT Outsourcing for Infrastructure, Payment Services, Services for Applications, Security and Telecommunication Services, serving over 3,000 corporate customers of all sizes and areas of business. Having about 1,500 employees and 4 data centers connected through its network, UOL stands out in that it follows its customers’ growing needs by offering top-notch products and services that have high technology, quality, and are quickly delivered to the customer. Always innovating, the UOL Group reveals its cloud computing platform to the market, being more robust with UOL CLOUD, bearing the utility computing concept and support from Intel® technology. Read the full UOL Adopts Intel® Trusted Execution Technology for Cloud Computing Case Study.